Like the expanding petals of a fluorescent orange water lily, Leticia Paler's plastic poncho ballooned up onto the surface of the black water peppered with chartreuse duckweed. She shrieked and her companions laughed aloud as Leticia's misstep plunged her into a seemingly bottomless pit of bog muck. While this may sound like the opening scene of a comedic home video, it was just the beginning of another session of Stalking Science Education in the Adirondacks. Why would Leticia and her colleagues?all of them New York State science teachers?subject themselves to these wilderness conditions for five days? Each would likely respond with a different answer. Among those answers would be the camaraderie of the group; the opportunity to enjoy a spectacular setting; the enthusiasm of the instructors, and the chance to expand their knowledge and understanding of the natural history of New York State. Most of them also would say that during their stay, they would learn practical teaching strategies they could use in their classrooms. 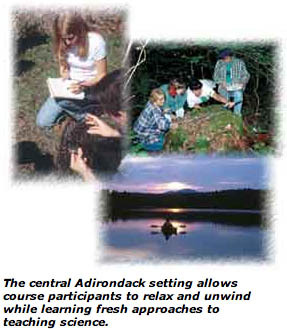 For the past sixteen years, this five-day residential course offered by SUNYs College of Environmental Science and Forestry (SUNY-ESF) has brought small groups of science teachers to the Adirondack Ecological Center, housing them in Huntington Lodge, a former Adirondack Great Camp on the shores of a picturesque island-studded lake with its own pair of common loons. Class begins each morning in the Adirondack Park Agency's (APA) Newcomb Visitor Interpretive Center nearby. Collaboration among SUNY-ESF, the APA, and organizations such as the Camp Fire Conservation Fund, Inc. is a fundamental strength of the course. 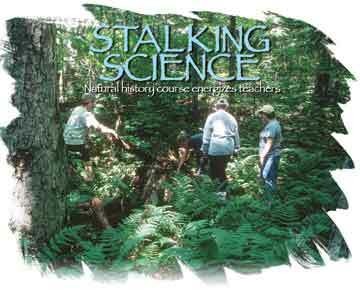 When I developed this course nearly a quarter century ago in another state, the course title "Stalking Science" was a play on the title of a popular Euell Gibbons' book, Stalking the Wild Asparagus. At that time, stalking was synonymous with the nature excursions of browsing botanists and eccentric naturalists. Today, more than 350 course participants refer to themselves as nature "stalkers." Stalking Science Education in the Adirondacks represents a facet of a larger conservation education program emerging from SUNY-ESF. The Theodore Roosevelt Wild Life Station was chartered by the state legislature and the Roosevelt family in 1919 to memorialize the only president who was a statesman, a conservationist and a naturalist. It embodies Theodore Roosevelt's devotion to science and conservation and his passion for natural history. The revitalized Station uses a combination of scientific research and education to link environmental quality and economic vitality in New York State. The Theodore Roosevelt Discovery Center is the model for a statewide conservation education classroom now on the drawing board. Stalking Science Education is important to the Center because it opens a dialogue with a network of educators who are willing to test new science education strategies. According to SUNY-ESF President Neil Murphy, #147;Stalking Science Education in the Adirondacks is a wellspring of knowledge that helps our teachers define for themselves environmental sustainability?the role of people in nature from an economic, social and ecological perspective." Although the course has evolved over the years, it remains true to its original goal of connecting students' nature studies to their local environment. By stressing ecologically based experiential science education, the course offers newcomers an alternative to "cookbook" scienc e and the memorization of scientific facts by rote. Conservation themes and unique methods of interpretation now guide program development and content, from published materials to field exercises. Teachers are encouraged to take their students beyond traditional lab reports by expressing personal studies of nature in the form of exhibits, newsletters, brochures, posters and presentations. By week's end, participating teachers have received personal instruction in the use of dozens of teaching tools that are as applicable to inner-city schools as they are to rural settings. Each of these tools helps to reinforce the curiosity that most students have about nature and encourages them to approach science as a problem-solving process of discovery. The tools also help students develop a greater appreciation for New York State's rich natural resources and a better understanding of the conditions that affect them. Participants begin Stalking Science by keeping a nature journal, guided by the work of famous naturalists and the study of seasonal phenomena. In pairs, teachers design their own research projects, testing approaches they might try later with their students. They collect data and "crunch" numbers, often during lunch breaks and other personal time. Teams often work late into the night of their own volition, poring over their findings and developing their presentations, with which they conclude the week's activities. No two days of Stalking Science are ever the same. However, several mornings begin with a traditional "early bird special," when the more hardy types arise before 6 AM to witness a mist-shrouded dawn in an Adirondack wetland. Sometimes they are joined by beaver, river otters and great blue herons. The songs of hermit thrushes, winter wrens and other native birds can be heard across the mirrored water, making the sacrifice of additional sleep even more worthwhile. At day's end, a popular activity is the "owl prowl," a kind of scavenger hunt to find owls. The week also includes a visit by a guest scientist. This summer, Dr. Alex Weir, a mycologist from SUNY-ESF, will join a long list of ESF faculty who have generously donated their time to the course. Each scientist brings fresh approaches and new knowledge to the program. Last year, Dr. James Gibbs, a conservation biologist, gave participants a salamander's eye view of the environment. If Stalking Science works, it is because of the dedication of the participants, many of whom modify their teaching when they return to their schools after a week in the wilderness. Brenda Travis, Science Department Chair for Penn Yan Central Schools, adapted Sprucing Up the Forest for her eighth-grade students. The students were required to evaluate whether their schoolyard was suitable for sustaining populations of the spruce grouse, an endangered species in New York. Mike Mallon and Dave Baker of James I. O'Neill High School in Highland Falls adapted much of the Stalking Science tool kit into a series of outdoor research opportunities for a year-long course. One student who was temporarily suspended from school asked that his suspension be waived so that he would not miss any of the classes?a fine example of how a new approach can motivate students. The synergism created by mixing veteran and prospective science teachers is one of the strengths of Stalking Science. For years, SUNY-ESF students have assisted with the program. Their youthful energy and idealism combined with the experience and wisdom of the veterans elicits an immediate bond. Dave Sutton, one of the veteran teachers from Campbell-Savona High School inquired good-naturedly how I get the wonderful students to do my work. And in contrast, one of the students wondered aloud how the teachers put up with the students! Given the number of students that a single teacher influences, each teacher's impact can be substantial. New York State Senator Carl L. Marcellino, a former biology teacher himself, sums it up best, "Stalking Science represents a breakthrough in conservation education. It combines the wisdom of Henry David Thoreau and Aldo Leopold with the energy and ideas of Theodore Roosevelt. Youngsters and teachers exposed to this remarkable program come away with a passion for science and science education and a new appreciation for New York State's natural resources." 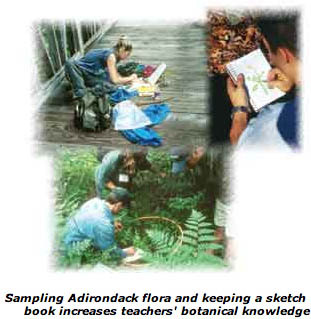 Stalking Science Education in the Adirondacks is committed to creating a zest for teaching science. Add to that a little magic; magic that is apparent in the camaraderie of parting science teachers around an Adirondack campfire under an ebony sky at weeks' end. Kitty McMahon captured this magic in her own words, "Don't forget...this program... relights our candles and recharges our batteries!" Author and illustrator of Adirondack Mammals, Andrew Saunders is Professor of Environmental Interpretation at SUNY-ESF in Syracuse and Associate Director of Education for the Roosevelt Wild Life Station. For More Information For more information about Stalking Science Education in the Adirondacks, contact D. Andrew Saunders by e-mail at dasaunde@mailbox.syr.edu, or by calling (315) 470-6759 or writing to him at 355 Illick Hall, SUNY-ESF, 1 Forestry Drive, Syracuse, NY 13210.